On Monday, July 21, 1919 at 4:55 p.m., a promotional flight of an experimental prototype of the Goodyear blimp flew over downtown Chicago toward The White City Amusement Park. The Wingfoot Air Expresss engine caught fire. 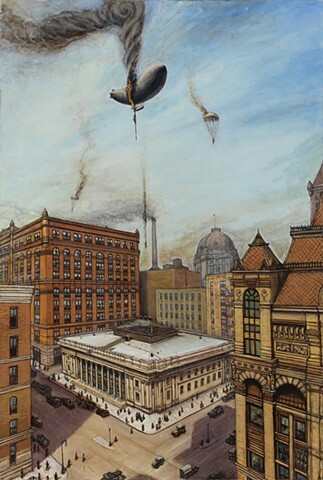 As it drifted over the Illinois Trust and Savings Bank at LaSalle and Jackson, the five men on board attempted to escape overboard with parachutes. The pilot and chief mechanic jumped to safety. One mans parachute caught fire, anothers got caught on the dirigible, and one man broke his legs upon landing his parachute and later died in the hospital. The burning blimp plummeted hundreds of feet, crashing through the huge skylight roof in the main banking hall of the Illinois Trust and Savings Bank, where 150 employees were preparing to leave work. Ten were killed and twenty-seven injured.